Orders placed by 4:00 pm EST and 4:00 pm PST Monday-Friday(our shipping dept. is closed on Sat and Sun) for “off-the-shelf“, in-stock items are normally shipped same day from the respective location (Peachtree City, GA or Corona, CA). Although we stock the vast majority of the items in our catalog, we cannot assure that they will all be on hand at all times. We ship every order as quickly as possible, and in the event of a delay, be assured that we are working hard to get your order shipped promptly. Due to order volume during holidays, we cannot guarantee that all orders placed can ship on the day after the holiday closure. Orders for spruce, plywood, metal, tubing and other special cut products may take a few days to ship depending on order volume. Special order products ship based on the lead times of each manufacturer. We will do all we can to get the order out the same day, but due to the varying locations of the vendor with stock, we cannot guarantee same day shipping. 2. Special Instructions may delay shipment of your order. UPS orders will need to be placed before 4:00 pm EST and 4:00 pm PST Monday-Friday to ship out the same business day. Click here to visit the UPS website for the most up-to-date transit time information. FedEx Priority & Economy orders will need to be placed before 3:00 pm EST and 1:00 pm PST Monday-Friday to ship out the same business day. FedEx Ground orders will need to be placed before 3:00 pm EST and 1:00 pm PST Monday-Friday to ship out the same business day. Priority Mail & 1st Class are not covered under our same day shipping offer. 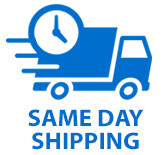 We will make every effort to get the orders out same day but due to varied pickup times, we cannot guarantee same day shipment. We will use the flat rate box service if your parts fit in the box and the service cost is less than USPS Priority Mail. Shipping Charges are automatically calculated by the web site at the cart screen on most items. Shipping charges on some special cut materials, hazardous items, and oversize items are unable to quote accurately online by our system. In these cases, the website will show the charges as TBD which means "To Be Determined". Once the size and weight of your order after packing are determined, the system will bill the exact freight charge of the chosen carrier. 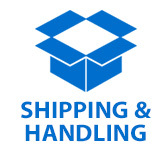 Shipping charges include insurance unless specified otherwise. Effective immediately Aircraft Spruce will offer free freight on truck orders over $5,000. Engine cylinders are excluded from this promotion. This is for all truck orders shipped to the 48 lower states from Aircraft Spruce West or Aircraft Spruce East. The order will have to ship from the warehouse closest to the customer. We will hold the order until we can ship complete from the closest warehouse to customer. If a customer wants us to ship and backorder, we will pay the freight on the first shipment by truck, but the customer pays the freight on the backordered items. UPS is the world's largest package delivery company and a global leader in supply chain services, offering an extensive range of options for synchronizing the movement of goods, information & funds. Headquartered in Atlanta, Ga., UPS serves more than 200 countries and territories worldwide and operates the largest franchise shipping chain, The UPS Store™. FedEx Home Delivery service connects you to every residential address in the U.S. What makes this service special is its residential-only delivery network and the flexibility to customize delivery to suit your recipient by choosing from three premium service upgrades.